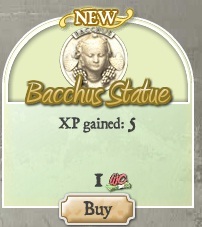 The Bacchus statue can be purchased in the marketplace under the boosts tab for 1 Wine Cash. After purchasing, the buyer can place the statue near their vine plots. up to ten plots. The plots then emit a glow when fertilized by the statue. Here is an example of the message you will receive when using the statue.